Pulling it all together at the last minute? So after the 7.00am cancellation of my 7.30am client session, what to do? Go back to bed and get a few more zzzzs? 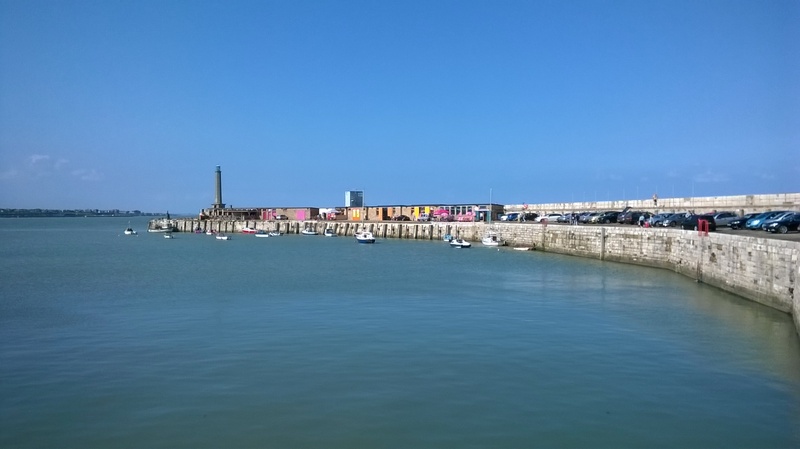 No, armed with a strong black coffee, I’m updating you all on my running week or more specifically the very last minute developments in my half marathon training! After my last half at the end of March I was determined to be ready for the very imminent Royal Parks Half Marathon by following a structured training plan. “Structured” in that I was planning to do a long 15kish run twice a month. This all fell apart from the outset and about three months ago I ended up devising my own plan which essentially entailed extending my running distances in line with the recommended 10% per week. Once we got passed the 6/7k point, this didn’t go entirely to plan either, partly due to a “dodgy ankle” which is still dodgy but not as bad. In the middle of August I managed a 13k run with no walking, followed by a 12k run/3k run walk a week later and a continuous 15k run a few weeks ago. Apart from that, just runs ranging from 5 to 8k. Then last week something miraculous happened! I did an 18k continuous run not once but twice and on both occasions the pace would have had me not far off my half marathon PB (achieved in 2008). How did that happen!? And even better, at the end of both runs I felt like I had another 3k in me – just! “Why didn’t you go for it then Jones”, I hear you ask? Well on the first occasion, I had only been planning on a 16k and the route I took left me 5k from home at that point and several inclines in between. One slight but loooong and one shorter but steeper and my mind couldn’t overcome those hurdles. The second time though, on Sunday evening, I stayed closer to home and by the end I was running 2k circuits to try to get the distance up. Bearing in mind I started out with just 5k in mind, this turned to “try to get to 8k”, “you can do 10k”, “12k would be good”, “another circuit for 14k”, “might as well do 15k”, “16k would be 10miles” and finally “it would be a shame not to do 18k again now you’ve got this far”. I think the dog walkers I passed three times were going through a sense of déjà vu but, hey. Because I hadn’t intended to run quite that far on Sunday evening, I hadn’t taken any water, etc with me and I think I was powered by the aroma of other people’s Sunday roasts! On the previous 18k I had used a freebie High5 energy tablet in my water. On my previous 15k run, I had used a freebie High5 energy gel which although not exactly tasty, wasn’t too revolting and reasonably palatable. 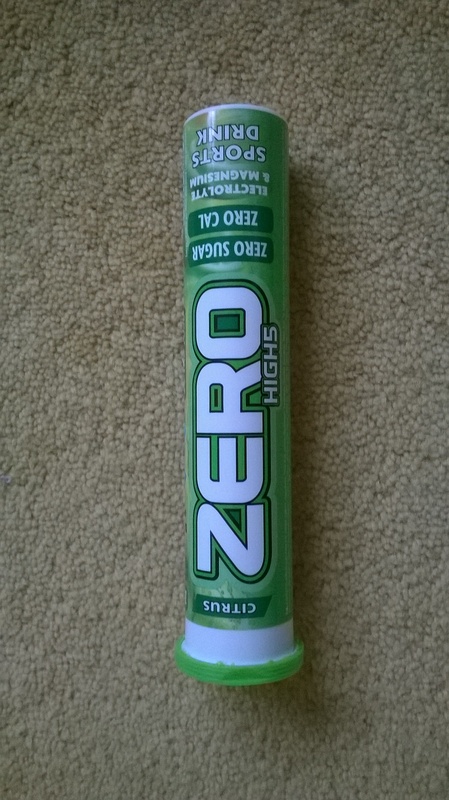 Neither resulted in any “digestive repercussions”, so I’ve invested in a tube of High5 Zero sports energy tablets. I’m a bit confused by the “zero sugar” “zero cal” claims. Where does the energy come from then? And in some respects as I managed to do 18k without any water or “fuel” on Sunday, do I actually need anything? But I’m not going to risk it on 12 October. And the drink’s got to be easier to handle than trying to extricate jelly beans from my running bum bag. I think one of the other things that got me around on Sunday was the thought that if I managed 18k, I could justify that as being my last “long run”. The pressure would then be off for the next two weeks and I could stick to cementing my running with a few 10ks and/or shorter. And I have lined myself up to be the tail runner at parkrun on the day before the run just to keep my legs turning over. So all in all, although it’s been a bit last minute, I’m feeling a bit more confident about my ability to complete the run. The distance is in the legs but now all I have to do is control my pacing in the first half of the route! In the meantime, I have an exciting exercise class coming up this week “Burlexercise”, a combination of cardio and resistance work incorporating showgirl elements and including weighted boas! Bearing in mind my complete lack of natural dance rhythm as evidenced on Saturday night at “Haven’t Stopped Dancing Yet”, and a few co-ordination problems, this could be quite interesting. I will report back! This morning I took part in my 46th parkrun and my very first away from my home course, Shorne Woods. I have to be honest, I didn’t venture very far to become a parkrun tourist, which incidentally was one of my fitness goals for 2014. I went a few more miles down the A289 and ended up at Great Lines in Gillingham. I was persuaded to try this course because I’d been told it was a faster course than Shorne. I had a rough idea of the terrain because I’d driven passed the Heritage Park, where the run takes place, on a number of occasions en route to a former client. This meant I knew there was a bit of an incline in the park and it’s an incline you have to traverse twice. It’s not steep but it is gradual and your only reward is the flat at the top as you run around the war memorial and the fact that you know on the return, you will be running back down that hill. Research had told me that the field at this parkrun was a lot bigger than I was used to so I expected there to be a lot more bunching during the run. I was proved wrong. The start of the run is spaced out over a wider area than I’m used to and there are no trees bordering the path to make passing other runners awkward. I recently ended up running into a branch at Shorne when I wasn’t paying attention! So the only crowded part of the run was just at the very start as we all headed out towards the first turning point on to a football pitch. This was a bit new, running on grass. The only area where we do that at Shorne is coming up to the finish funnel. Running on grass certainly dampens down the sound of all those feet pounding the ground! I think it’s about 500m before you start your first attempt at the hill and I found it a bit hard because at that point I’m still warming up and trying to get passed my pain threshold (that’s usually the point 5 minutes after I’ve finished!). The other thing that made it hard was the knowledge that you were going to come back up the hill again somewhere around the 3k to 4k point, which the new runners briefing marshal told us was the hardest part! When you get to the top of the hill and run around the war memorial, you’re rewarded with the sight of the Medway towns in the valley below and this morning was a bit misty and damp which gave everything an eerie silent atmosphere. Broken only by the sound of crunching gravel under foot and runners gasping for breath. Anyway, back to the run. As is my usual want, I took a glance at my watch at the 1k mark and was surprised to see it telling me 5’ 11”, usually it’s around the 6 minute mark before I pass that marker and it was at this point that I noticed the 25 minute pacer just ahead of me. Panic time! After that point, I tried my best not to look at my watch again until I started coming down the hill on the last lap. That’s when I realized I could beat last week’s time and get another PB. Bit like buses, wait five months and then two come along one after the other! So as I passed the finish line and stopped my watch, it told me I’d done exactly 5k in 25’ 16”, a whole quarter of a minute faster than last week. Now although I’d been told I’d find it faster, I assumed with it being my first time on this route, I would be a bit slower because I didn’t know where I was going but happily it appears not. Unfortunately, when I received my text result, it informed me I had apparently finished in 24’ 58”. I say unfortunately because I know there is no way I did that sort of time. I’m still here to write this blog piece for starters! I checked the results table later and that was the time attributed to position 63 – me. Now as much as it would be nice to think that was my time, I knew it wasn’t and I was concerned that it would be set in stone. Apart from anything else in order to achieve another PB I would have to try to go even faster! It might be that my running fans (?!) would be amazed at my speedy legs but in my heart of hearts I would always know it was not actually the time I’d run. And what’s the point of cheating and taking all the plaudits for a wrong time, I’d only be cheating myself! Since then, I have been told that there were problems with tokens 60 to 70 and I was a bit slower than announced and that has made me very happy and strangely relieved. How bizarre to be saying that! So I await my revised finish time with a sense of relief, I can now hold my head up high. 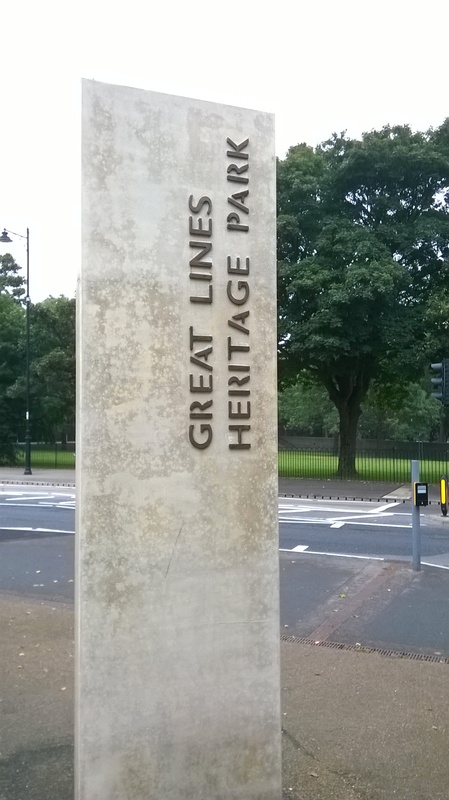 Just as an aside, Great Lines is in a more urban area than Shorne and I did find it a bit disconcerting walking back to my car to pass several people clutching cans of alcohol at 9.30 am!! Well that was a bit different and definitely not according to my plan! On Monday evening I went out for a running buddy client session and performed the most spectacular flying leap known to mankind! I tripped over something (or it could have been that I was too busy looking at the ornate external architraves on the houses we were passing). Whatever it was, it was one of those trips when it looks pretty certain you’re going to make contact with the ground and its only by dint of strong core muscles (or so I like to tell myself), that you manage to avoid making a complete and utter fool of yourself and end up in a heap on the pavement. I think the couple walking in front thought they were about to be mugged or fall foul of a stampede of elephants but I managed to stay on my feet and tried to carry on nonchalantly while all the time thinking oooh, my bad ankle hurts. Fortunately this did happen towards the end of our session and I did manage to make it to the end without whimpering. But I was seriously concerned for my foot’s well being the following day. When I got up it wasn’t as bad as I expected but I decided that the long run I had planned for that day would be best postponed and I went for a sports massage instead. 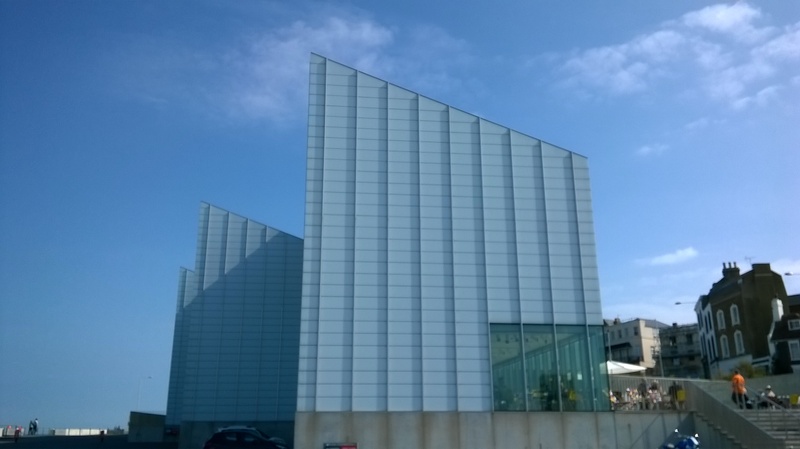 On Wednesday my exercise consisted of a hike from Joss Bay to Margate and back with a quick stop for coffee at the Turner Contemporary Gallery. 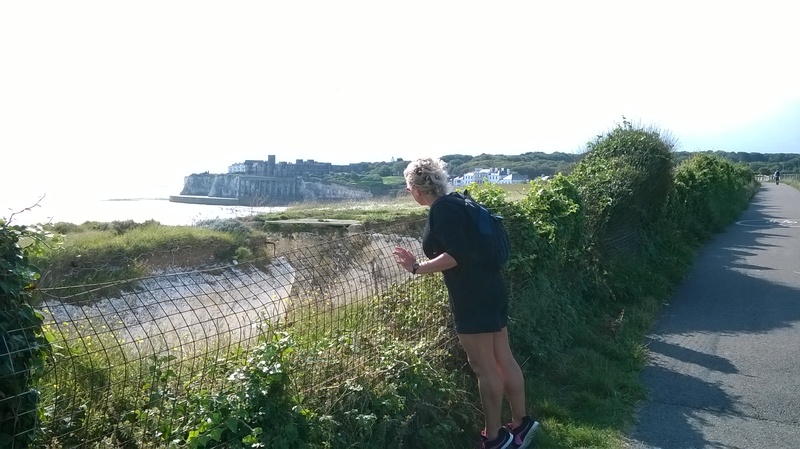 We calculated the distance to be somewhere around the 7/8 mile mark and by the time we got back to Joss Bay, my legs were seriously looking forward to a dip in the cool sea water. I hoped that the “ice bath” (and that’s not a bad description) would help to alleviate some of the aches and pains. 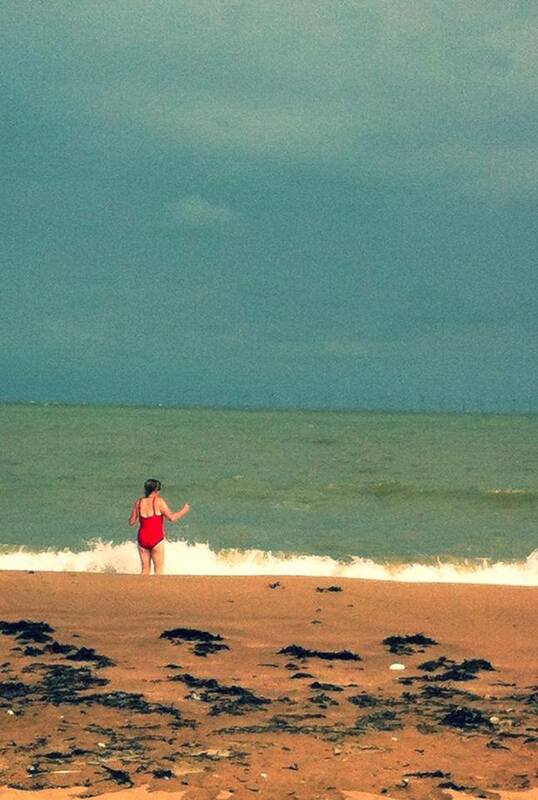 They did to a certain extent but I had gone into the sea in just a swimsuit and I lasted about 20 minutes, having derided a couple of other bathers who’d donned wetsuits. On Thursday, having had a cancellation, I had an opportunity for an impromptu run and so I decided to see what would happen. I decided to take it easy and go no further than 5k and I was glad to say there appeared to be no lasting damage. Despite this, I turned up at yesterday’s parkrun worried about having to pull out part way around the course. Just coming up to the 1k mark, I passed a runner who usually finishes a couple of minutes ahead of me. I thought “she must be having a bad day” and then I looked at my Garmin and thought “perhaps not!” I was 30 seconds ahead of my usual 1k time so then I started to panic that I wouldn’t be able to keep the pace up but by 2k, I was still 30 seconds ahead of myself. This continued through the 3k and 4k marks, by which time I was starting to think about walking. But I was also starting to realise that if I could just keep going a bit longer, I could possibly achieve a new PB. I was also reminded of a tweet I had seen earlier that morning which ran along the lines of “Pain is temporary, failure lasts forever”. So with that thought stuck in my brain, I pushed on to the end and took 22 seconds off my previous parkrun PB. I have no idea how it happened, it certainly hadn’t been anywhere in my mind to try for a quicker time but I’m very pleased it did. Although the pressure’s obviously now on to reduce it even further! Having decided to postpone my long run from earlier in the week until Sunday, I got up this morning with a feeling of foreboding. I had to work mid morning so I knew I couldn’t start until lunchtime and it was with a bit of a struggle that I came home, donned my running gear and headed out the door before the desire for a cup of coffee overcame me. I’ll be honest, I really wasn’t expecting much but I took a High5 energy gel and water with me so I couldn’t use dehydration/lack of energy as an excuse for pulling out early. There was a strong sense throughout that I was dragging my legs around with me and I did make the classic mistake of doing a two lap route (and hence making it easier to quit), but somehow I persevered and made it around 15k without walking. Now this still doesn’t mean I’m keeping up with my training plan, I think I should have done 19k this week. But it does give me a bit more hope that I’ll be able to get around 21k in four weeks time. So what started out to be a bit of a disastrous looking running week finished quite well, if I do say so myself. 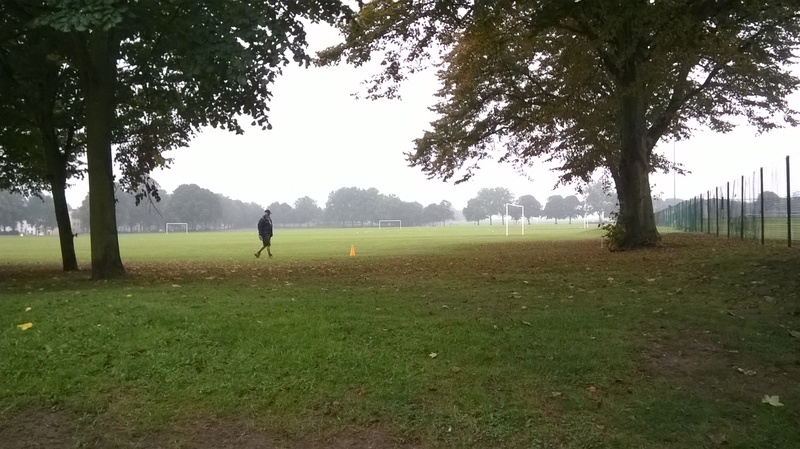 And next weekend I’ve been persuaded to try out parkrun at Great Lines (Gillingham, Kent). I’ve been told it’s a faster course than Shorne Woods so I could potentially get another PB – this is what I’ve been told anyway. I’m not totally convinced but we’ll give it a go. It will in any event, tick off another of my 2014 fitness goals – to become a parkrun tourist. There are two televised runs which I insist on watching during the course of the year, one is obviously the London Marathon and then the other is the Great North Run, the half marathon that starts in Newcastle and ends at the seaside in South Shields and they are both runs I’m pleased to say I have done. Actually I say there are two but when I started to think about it, there’s also the Great South Run, the Great Birmingham Run, the Great Manchester Run …. Anyway, you get the picture! If it’s televised, I’m probably watching it and, as with this morning’s GNR, wishing I was there doing it! 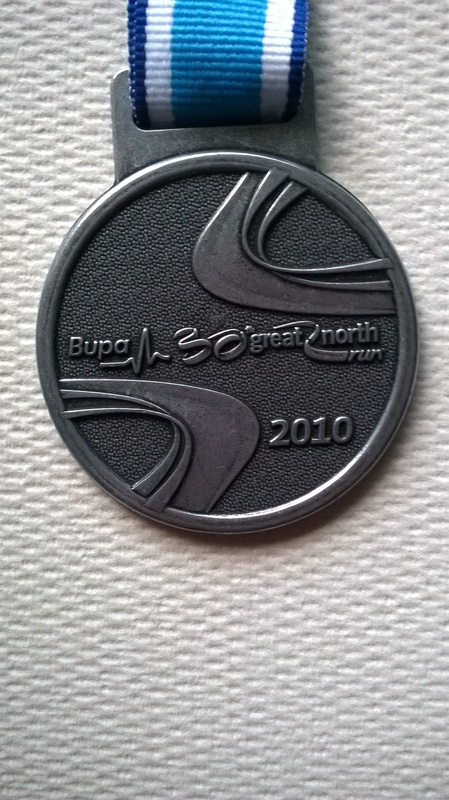 I did the GNR in 2010. It didn’t go exceedingly well, it poured with rain from the moment I left my hotel until the start of the run and then from the finish of my run until I got back to the same hotel. When we needed a bit of moisture to cool us down, we had to rely on the kind gentleman standing on top of a bus shelter hosing us down! The rain at the end was so hard, we couldn’t actually see the Red Arrows, just hear them. Today, however, the weather looked glorious. Although as all runners know, sun and warmth are not necessarily your friend! And then of course there was my continuous inability to pace myself! The first part of the run is downhill and when I passed the 1 mile marker in 8 minutes, one half of my brain was saying slow down for goodness sake, whilst the other half was saying but if we kept up this pace ….. Needless to say, by mile 4 I was taking my first walk break. Me and my brain are going to fall out big time one day. I was also due to take part in 2012 but because of my recent anaemia diagnosis and my pathetic running, I made the decision to defer my place to the following year. My running had gone to pot during the course of the year and the lack of training meant turning up would be torture for me. (Do I make myself sound like some sort of elite athlete!?) By the time of the ballot for 2013 (and about the time I started my blog), work was poor and funds were limited so I decided not to participate even though I knew I was guaranteed a place. When I say funds were limited, in the scale of things, this run is not outrageously expensive. In fact for the fantastic organisation behind any BUPA Great Run, I would say their runs are very good value for money. It’s the travel costs and hotel accommodation that makes an “away” run cost almost as much as a cheap holiday abroad! And this is one of my little bug bears – hotel accommodation in the areas surrounding a mass participation event. The hotels know they’re going to be fully booked so why do they have to, in some cases, double their rates? Even budget chains are at it. Probably 99% of runners are raising money for a personal charity, so why can’t the hotels show a little more consideration? Just corporate greed at its best! Anyway, rant over and back to today’s run! Can’t speak for anybody else but as much as I was holding my breath willing Mo to cross the finish line first, he wasn’t my hero/heroine of the day. (Does anyone else get really frustrated when he keeps looking over his shoulder? If he hadn’t kept doing that he might have broken the hour!) My heroine was Gemma Steel, finishing second and with a PB. I passed her last year when running the Great Yorkshire Run. Yes, okay, like with my meetings with Mo at the BUPA London 10,000, she was running towards the finish just as I was setting out! Apparently there has been some pressure on Gemma to consider moving up to the marathon distance and Brendan Foster gets the award for stating the bleeding obvious during the commentary. He said you shouldn’t consider doing a marathon unless you “fancy it” because it’s “an awful long way”. Yup, he’s right, it is! And it’s not just the elite runners who inspire you. Watching all the “fun” runners at the start and then 13.1 miles later crossing the finish line is (and I really hate this word) “awesome”. So I was sitting there this morning, thinking hang the expense, I’m going to put my name in the hat next year. A weekend in Newcastle can be my holiday! Before my first GNR ballot attempt, runners that I knew all bemoaned the fact that they had never been lucky in the ballot. And hey ho, I get in first time round! Then, when I entered my second ballot, I was successful again. So what’s the betting I wont get a place next year!? And can I just say, how do people look so good after running 13.1 miles? It’s the same with the London Marathon, they interview people post race and they look immaculate, like they’ve just gone for a stroll around the park. Me, I look wrecked after running 5k! On the plus side, all this inspiration has given me a mental push for my own training. 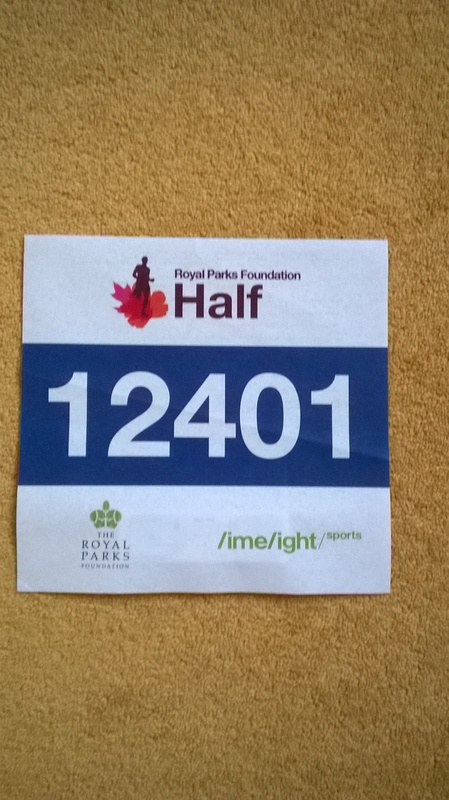 Five weeks to go until my second attempt at the Royal Parks Half Marathon and I have a feeling they’re going to go very quickly.